Don’t be Intimidated, be Prepared! Disasters small and large can come from a variety of sources, not just the “big one.” You don’t have to be a doomsday prepper or spend vast sums to become a “master of disaster.” See some of our tips, videos, and links below. We are also looking for motivated neighbors to help develop a disaster plan. Please contact us. When power is off or cell towers down, you can still communicate. FireChat is a social networking app designed to work even when the internet and cell service do not. The app creates a network among FireChat’s users, linking together users’ smartphones like a daisy chain. When you send message, it will jump from FireChat user to FireChat user until it reaches the recipient. When the app is open, you can see a list of other FireChat users who are close by. The app is especially useful for community members and neighborhood groups like the Jefferson Westside Neighbors to connect with each other in an emergency. However, you don’t need an emergency to use FireChat. The app also works with WiFi and cell service. FireChat has public chatrooms as well as private messaging. It’s easy to create your own public conversation or private group. You sign up with an email address and you don’t have to use your real name. You can share photos along with text messages. Go to opengarden.com/how-to.html to learn more about FireChat. Go to the Apple AppStore or Google play to download the app and try it out today. As we have seen in the Hurricanes and fires in 2017, help may not arrive soon. In the event of a regional disaster, Portland, Seattle, Olympia, and Salem may take a lot of the focus and resources. 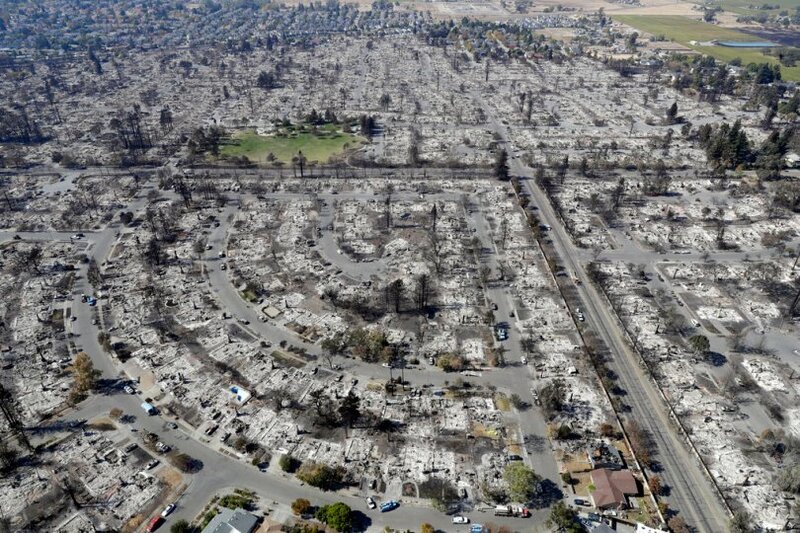 Despite the location of epicenter of the 1989 Loma Prieta earthquake in Santa Cruz county and major local destruction in the smaller cities of Watsonville and Santa Cruz, most attention resources were focused on San Francisco and Oakland 90+ miles away. In the next 50 years scientists estimate there’s a 37 percent chance of a magnitude 8 to 9 earthquake striking somewhere along the northern half of the West Coast, known as the Cascadia Subduction Zone. That’s better than 1-in-3. To put that in perspective, your chances of dying in a car crash is 1-in-114. If you take the time to fasten your seat belt or make an effort to drive carefully, you may want to consider doing a little preparation to help you survive a major disaster (see below). Some parts of the JWN are considered to be in flood zones. This map is from here. 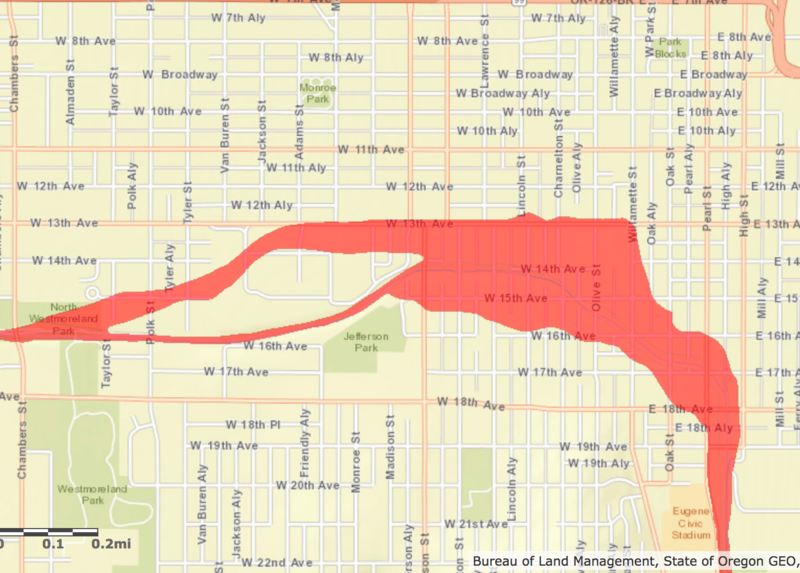 However, in the event of catastrophic dam failure in one of the 9 major dams in our area, downtown Eugene could find itself under 42 feet of water. Some emergencies you can shelter-in-place, others require you to evacuate. In the 2017 Northern California wildfires the difference in living or dying was a matter of minutes. This neighborhood was considered “fire safe.” Take a minute and think, if you had to leave immediately with what you could grab and throw in your car, what would you take? Could you remember that list if you were rousted out of bed at 2am? Here are some easy steps for getting prepared – chances are you already have many of the items you need! Being prepared can be as simple as keeping your phone charged and a half tank of gas in your car. You don’t want is to be searching for your water and gas meters in the dark/rain in the middle of an emergency AND then trying to figure out how to shut them off. You will need to place a large screw driver (for the water) and an adjustable wrench (for gas) where they are within easy reach. Seal them in a NEW Ziploc-style plastic bag near your gas meter, inside the front door, or in a readily accessible AND memorable place. PRO-TIP: tools like screwdrivers and wrenches are cheap and easy to find used at garage sales or thrift stores. First locate your water meter, typically a covered underground box near the curb. You can use a screw driver to lift off the lid (keep one handy). If you live in a multi-family dwelling ask the manager or landlord. IMPORTANT! Only turn off your gas if you suspect a leak (smell of rotten eggs). If you turn the gas off, LEAVE IT OFF, and call NW Natural at 800-882-3377. Do not turn it back on yourself. Appliances and natural gas lines will need to be checked for possible damage before service can be restored safely. Locate the shutoff valve on the riser pipe from the ground to your meter or, on newer meters, the service line going from your meter into the house. Use an adjustable pipe or crescent-type wrench to turn the valve a quarter turn in either direction. When the valve head is parallel to the pipe, it is in the OPEN position. Turn the valve head crosswise (perpendicular) to the pipe and it will be in the OFF position. We tend to take water for granted, but we need it not just to drink but to cook and wash. You need 1 gallon of water per person per day (don’t forget pets!) to survive. The CDC recommends you keep a minimum of 3 days of emergency water, but 2 weeks is a safer bet. That is how long the state projects it will take to restore water service after a major earthquake. There are several easy ways you can accomplish this. Buy bottles or a case of water. Places like Costco or Bi-Mart are often the cheapest. Use your own CLEAN containers such as used water cooler bottles. Avoid glass that can break in an earthquake and keep in mind water is HEAVY. Buy PBA-free water containers. EWEB sells 3 gallon containers at cost ($5) at the EWEB building downtown. Step #2: Be able to disinfect your water. Bottled water can become contaminated after long periods or if you store tap water. There are a couple of easy ways to decontaminate water. Get a bottle of unscented liquid household chlorine bleach (label should say it contains between 5-6% and 8.25% of sodium hypochlorite). Use 1/8 teaspoon per gallon, shake well, uncover, and wait 30 minutes before drinking. Pro-tip: write these instructions on your water bottles and store the bleach next to your water. Buy a filtration device. There are a lot of these devices made for emergencies and camping. Many are as little as $10 (often less on sale) and can filter hundreds or thousands of gallons of water. Food (3 days to 2 weeks) and don’t forget pets! Storing emergency food can be a daunting challenge, especially if you do not generally eat a lot of processed foods. But if you think about it, many of us already have food that can act as an emergency reserve. Here are a few strategies you can use to make sure you won’t go hungry in an emergency. Important caveat: you will need a way to heat/cook food without power or gas! So if you do not have a camp stove (more below) focus on foods you can eat without cooking. Inventory: Review what you typically have in stock. Break it down into meals and then figure out how many days that would cover. That is your baseline reserve. Keep in mind perishable and frozen foods will need to be consumed first. Double-up: We typically buy set amounts of staples. Instead, buy double and then replace once you use one. For example, buy bricks of pasta at Costco. Peanut or other nut butters are dense (provide a lot of nutrition per ounce). Get several. Buy Bulk: Buy 25lb bags of staples like rice and beans. It is cheaper and provides a reserve. Can-Do: Canned foods are durable, easy to use, and can be heated in the can or in many cases eaten raw. One can, per person, per meal. You can rotate your inventory each winter by giving them to a food drive and then restocking. Prepper: if you are looking to go full-prepper, you can get MREs (meals ready to eat). Prices vary, lasts 5 years, self-heating. You will need some way to heat/cook food. Camp stoves are inexpensive ($25+) and often can be found at garage sales for cheap! Check out buyers guides online to choose the right one and the fuel it uses. Many BBQs also have burners where you can boil water. A more expensive, but widely useful, option is a battery back-up ($150+). These are batteries that can be left plugged into a wall outlet or charged via your car or solar (extra). You will need an electric hot plate ($20+). The 2017 holiday fire that killed 12 people in New York would have been slowed enough to allow people to escape if the door to the apartment had been closed. If there is a fire, shut the door to the room when you leave and call 911 AFTER you and everyone else are outside. As we discussed above, in the event of an earthquake, shut off your water. This prevents drinkable water in your home’s pipes and water heater from draining away. Keep a pair of shoes with a solid sole under or near your bed. There may be broken glass or debris after en earthquake and if it happens at night the thing you want to do is stumble around barefooted!